Agnes Martin is one of my favourite artists. 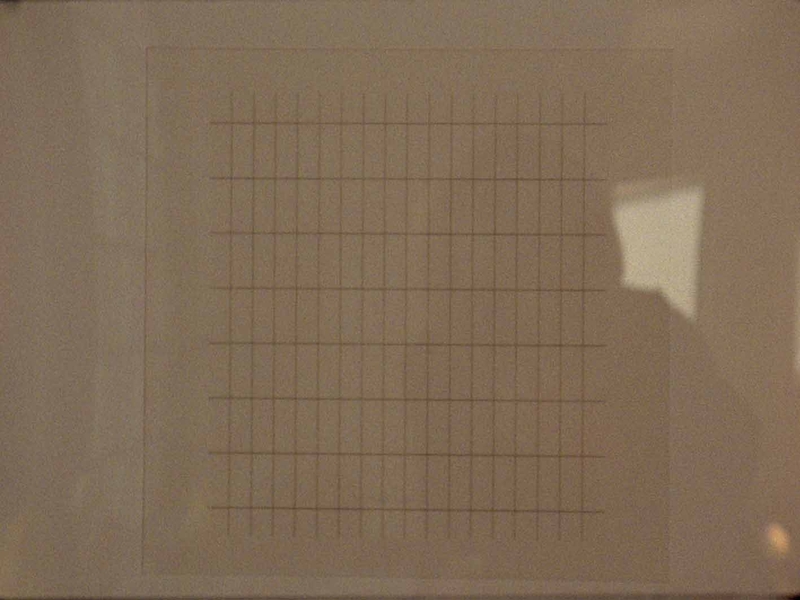 A collector I know, Maud B., owns two screen prints by Agnes Martin from the series On a Clear Day. She has them framed behind glass in her apartment, hanging in a corridor close to a big window. In front of one of the screen prints I installed a 16 mm camera and left the diaphragm on 4, for an average light value. I asked Maud to film the work whenever she passed by and would look at it – for as long as she watched it. She filmed it each time she was struck by the way the light was playing with the work and influencing her perception of it. The differences in light and colour in the film, due to the fact that the diaphragm was never adjusted, correspond to the different moments of looking at the work and make the image merge with its environment to various degrees. The 16 mm film Maud Capturing the Light ‘On a Clear Day’ is part of a larger research project on rhythm. It involves an exploration, through various film works, encounters and experiments, on how our individual rhythm (freed from societal rhythms), thanks to moments of empty time, create a space for inspiration, concentration and creativity.